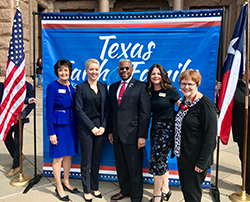 For the ninth time during a session of the Texas Legislature, Concerned Women for America of Texas hosted “Dinner with Texas Legislators.” This year, seventeen Texas legislators participated in the program on Tuesday evening, March 12, at the DoubleTree Hotel in Austin. Each legislator had a moment at the mic to speak to the gathering about issues important in the current session. Several spoke of CWA’s current prayer campaign to encourage legislators during the session. Rep. Bill Zedler, long-time advocate for life and family values in the Texas Legislature, was awarded the 2019 CWA Family Advocate Award. Mrs. Pat Hanson, who was the South Texas Area Director was commended for many years of service before her retirement. Lastly, Dr. Shea Garrison, Vice President of International Affairs for CWA, was the dinner’s keynote speaker and addressed gender identity issues confronting women and their families in the current culture. 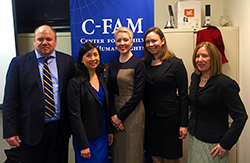 Several young women who are part of Young Women for America’s leadership on Texas college campuses were present. The dinner preceded the subsequent day’s rally at the capitol, where several hundred participated in visiting with legislators about Faith-and-Family issues. 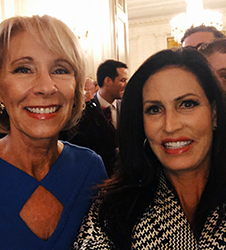 CWA CEO Penny Nance with Secretary of Education Betsy DeVos. President Trump signed an executive order to protect free speech on college campuses today. Because of our Young Women for America chapters and efforts across the country, we were asked to be there when he signed it! Our YWA leaders have been effected by, and watched first-hand, the attack on the First Amendment on college campuses. Because of YOU we have a seat at the table to promote constitutional principles and fight for the future of America. We are thankful for the President’s commitment to ensuring that the rights of every student be protected. He also discussed information transparency and student loan debt. Read the executive order here. On the heels of the most electrified month of the life debate, 80% of Americans have spoken out that they do not support infanticide. 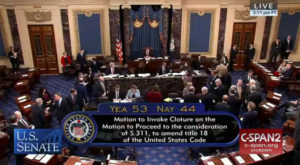 Forty-four members of Congress blocked a bill ensuring medical care to LIVING, newborn babies who survive an abortion. And they voted NO. To not provide care to crying babies after a failed abortion attempt. Every Democrat who made remarks on the Senate floor before the vote was claiming that this bill was an attack on a woman’s right to abortion when nothing in this bill touches abortion. We’re talking about AFTER abortion. Whether it be their personal inhumane carelessness or their allegiance to the radical extremism of partisanship, there is no covering up such a disgusting ploy. That was the question that replayed in my head as I watched the votes roll in on the Born Alive Abortion Survivors Protection Act. Keep fighting, dear friend. And keep praying.